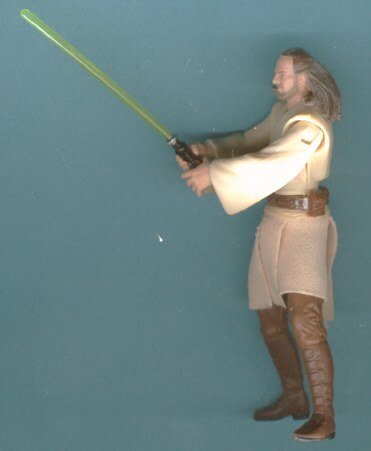 Qui-Gon is made from a Mos Espa disguise Qui-Gon head, chest, & arms; and "soft-goods" Qui-Gon pelvis, skirt, and legs. I boiled and popped each figure. With the soft-goods figure I put a rubber band around the skirt and hung the figure upside-down in boiling water, so the fabric would not get wet. I then put the pieces I wanted to use back together and glued them in place. 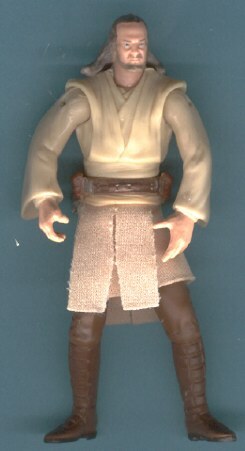 No special cutting was involved; the peg on the pelvis (for the waist articulation) fit just fine with the Mos Espa Qui-Gon chest.